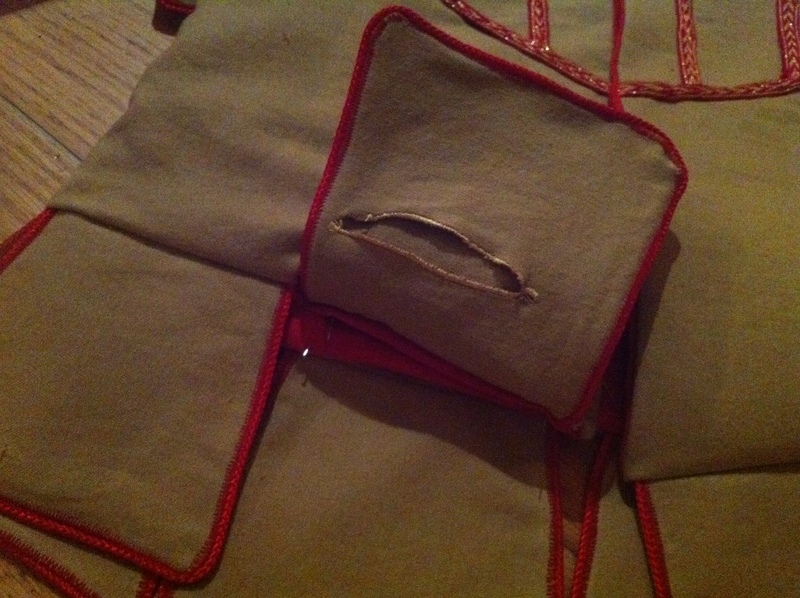 Today’s Garb-A-Day project is pants. So far I’ve made Alexander a pair of linen, fitted breeches to go with his Elizabethan shirt. 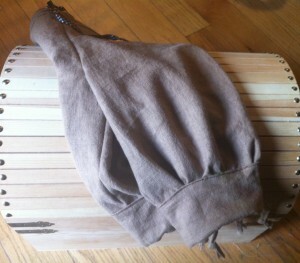 They aren’t necessarily constructed in any historical manner — I doubt they will last that long knowing my kid anyway. I also made them exactly to his size, rather than a bit larger, as I didn’t want his pants falling down on him while he was playing! 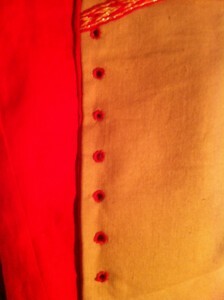 I think they look quite nice, though. 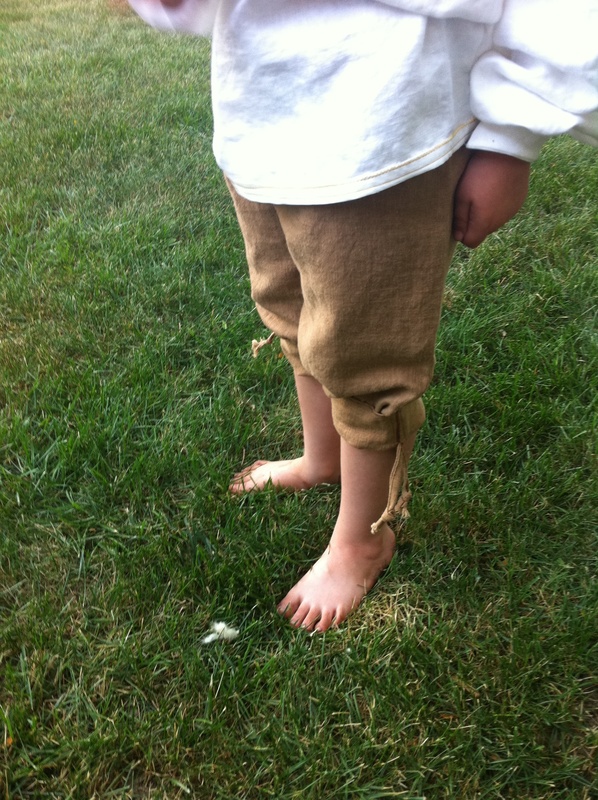 I got the directions on how to make these fitted breeches from Dawn’s Costume Guide — I simply used a pair of Alexander’s pants as a guide for the measurements. 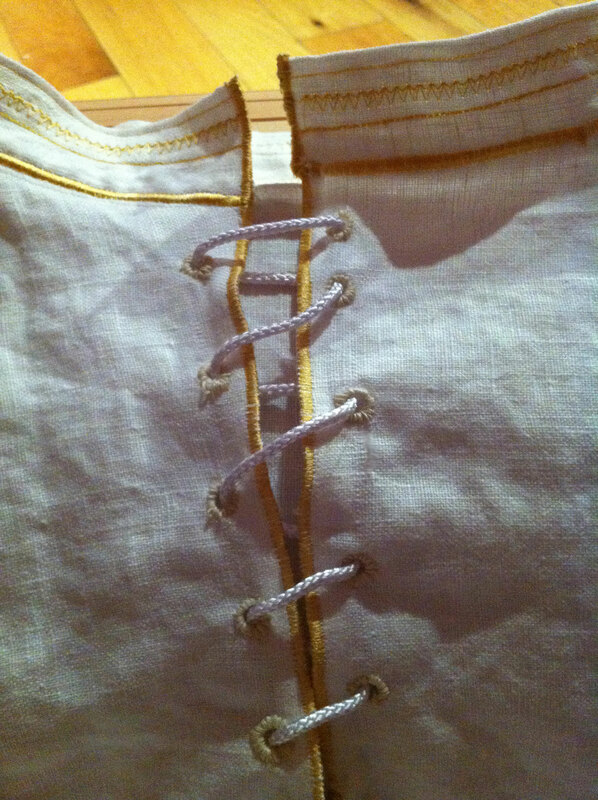 I used drawstrings for the waist and legs rather than buttons or snaps, just to give us more flexibility. 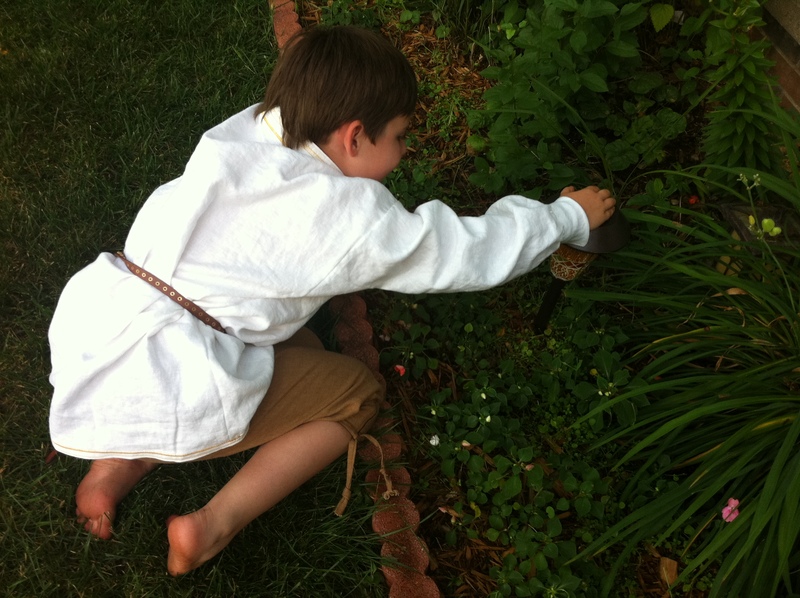 Oh … and Alexander likes them! 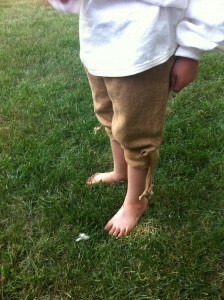 And he’s already managed to get a grass stain on ’em. That’s my kid! 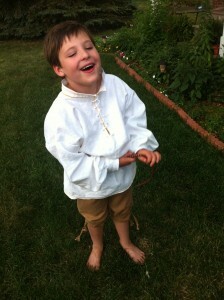 My 6-year-old announced yesterday that he’d like me to make him a pirate outfit to wear at Pennsic. I’d already explained to him on several occasions that pirates weren’t really what we were going for. Then he proceeded to show me a pirate fact book he has that shows that pirates were around in the time period that the SCA covers. Sure enough, he was right. 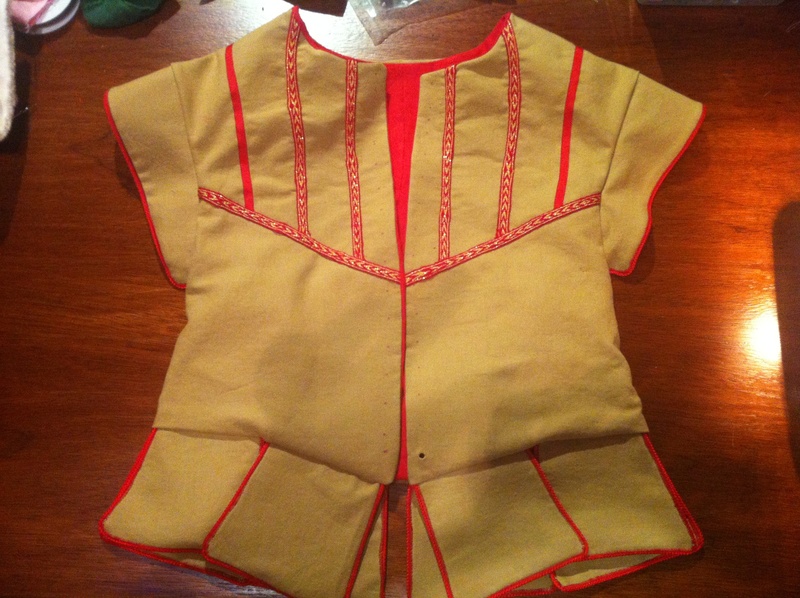 Since he did “research” and is attempting to satisfy the “rules” of the SCA, I feel I should try to make him something a pirate would wear. 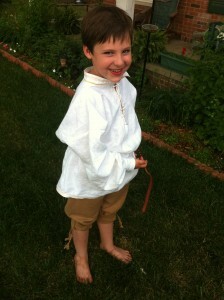 Of course, his idea of what a pirate would wear (think Jack Sparrow) is different than what a pirate actually wore. But I just wasn’t sure what to make him that he’d like, that would be reasonably accurate, and wouldn’t be time-consuming to construct. 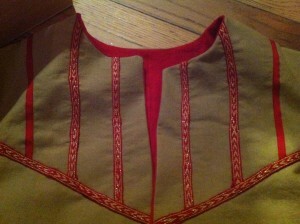 So I asked the helpful folks over at SCA-Garb and they came through with several ideas for me! The first idea is to make him an Elizabethan shirt, as they are similar to “poet” shirts that are commonly depicted on pirates in popular media. Plus, pirate captains were mostly nobles or gentlemen (how else could they afford a ship and crew? 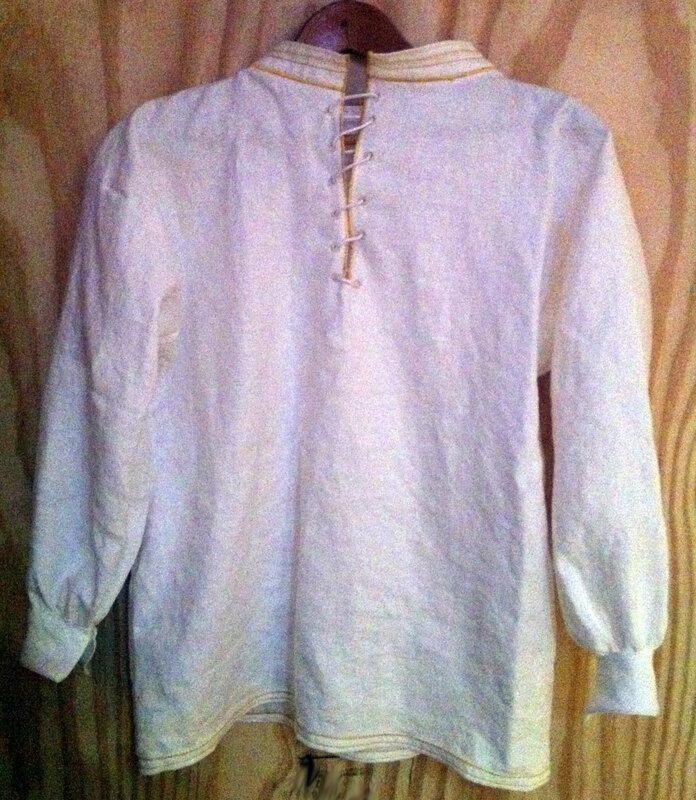 ), and it’s likely captains during Elizabethan times work similar shirts. 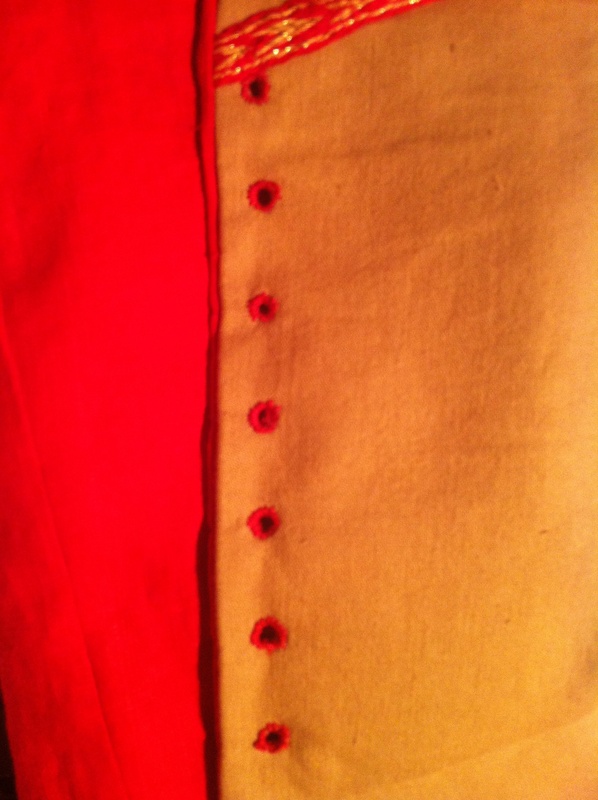 I looked about and found a web site that had a shirt pattern from The Museum of Costume, circa 1585-1600. Perfect! I adapted it to my son’s measurements and, with the approval of my son, went to work! We did change two things from the pattern. For one, we didn’t do blackwork, but did use some gold thread around the collar and the shirt bottom. 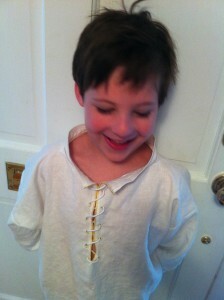 My son LOVES anything gold, and in his mind it goes along with being a pirate (gold, gold pieces, treasure, get it?). Sure, it’s not accurate, but who cares! Also, I put lacing at the top of the shirt to help it fit him better, as I’d made it larger than necessary so the shirt would be wearable for longer. Actually, now that I think about it, I made two more changes — no drawstrings at the neck and wrists and no slits on the side. 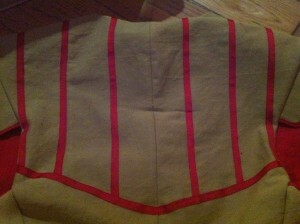 But other than all that, it’s the same as the pattern … including neckline gores! Those are a first for me. 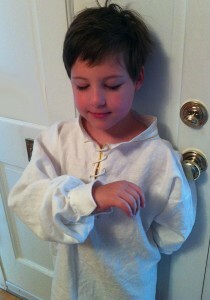 A shirt fit for a swashbuckler! 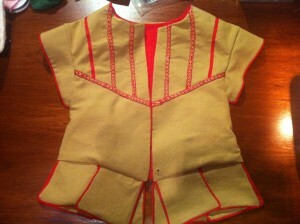 I can’t wait to show Alexander the finished shirt in the morning! 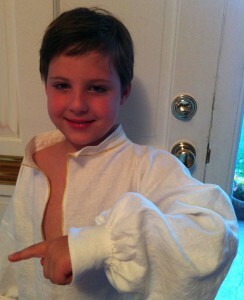 Update: He loves the shirt .. and looks quite dashing in it! And that completes today’s Garb-A-Day goal … yay!